Four years ago, police started evicting Occupy Wall Street protesters from Zuccotti Park in New York City. Justin Wedes remembers it well. It was one of several times he was arrested for protesting as an Occupy Wall Street organizer. "I think there's a general sentiment, even amongst many on Wall Street, that our current political and economic system isn't working," says Wedes, who has now returned to his hometown of Detroit. The Occupy tent cities are gone, but the movement has had a lingering effect on American politics -- and even Wall Street itself. Big banks no longer carry the prestige they once did. Top college grads increasingly want to go to Silicon Valley, not Wall Street. They see tech as a better way to make money and change the world. "People could not be fleeing Wall Street faster at this point," says Baiju Bhatt, a computer whiz who used to work on Wall Street. "All the kinds of people I remember who would have gone into consulting or finance are definitely trying to get jobs in tech right now." Bhatt is part of that exodus. He moved to San Francisco and founded Robinhood in 2012, a trading app that is shaking up the industry by allowing people to buy and sell stocks for free. Investment banks like Goldman Sachs (GS) have responded by increasing their starting salaries and enacting "sacred Saturday" policies to give young bankers a day off. Overall, Americans have lost respect for big banks. In Gallup polls, just over a quarter of Americans trust banks today. A decade ago, it was over 50%. 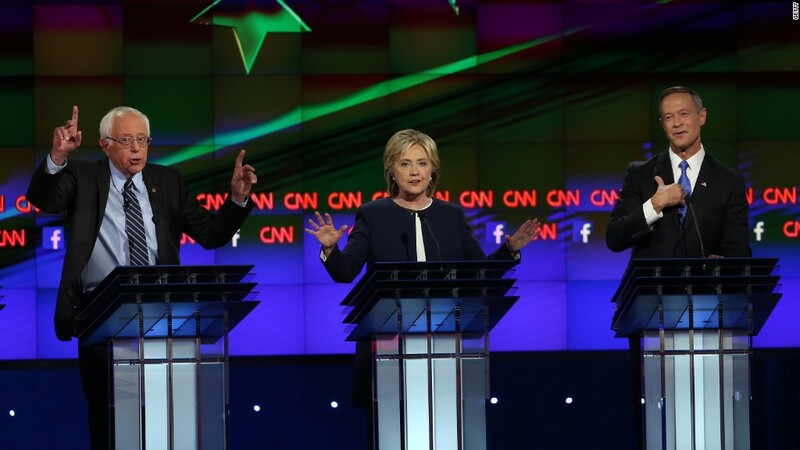 Bashing Wall Street has become a popular 2016 campaign issue -- and not just for far-left candidates like Bernie Sanders. The last Republican debate on Fox Business struck a very anti-Wall Street tone. John Kasich said bankers "need a good ethics lesson." Ted Cruz quipped that big banks "get in bed with big government." Donald Trump has gone as far as saying hedge fund managers are "getting away with murder." Both parties have proposed increasing taxes on hedge fund managers. On top of that, Democrats Bernie Sanders and Martin O'Malley want to break up the big banks by bringing back the Glass-Steagall Act. Hillary Clinton won't go that far, but she has plans for more regulations. "The public is still upset about the financial crisis," says Alexis Goldstein, who worked on Wall Street for 7 years before joining the Occupy movement. Now she is a senior policy analyst at Americans for Financial Reform. "The focus on inequality...is very much a legacy of Occupy Wall Street," argues Goldstein. Banking is having a day of reckoning at the moment. It is not as profitable as was before the crisis. The Financial Times is doing a series on the "turmoil and decline" of the banking industry. As the FT points out, even JPMorgan Chase (JPM), Wall Street's most profitable bank, has a return on equity of just 12%. That's way down from the 25% to 30% that banks regularly generated before the 2008 crisis. To put it another way, Wall Street bonuses are down and the worries are up. Top bankers blame regulation. JPMorgan CEO Jamie Dimon likes to say banks like his are "under assault" from regulators, especially after the Dodd-Frank reform law was passed in 2010. But the problems go deeper than that. Banks simply don't make as much money anymore on trading. Instead, they have tried to do more deals (think: mergers and companies going public). They have also beefed up their asset management divisions where they invest other people's money. There's a lot of competition now -- from other banks around the world (China now runs 4 of the world's top 5 largest banks) and from tech startups like Robinhood. "Competition has made things move much much more quickly. If you don't do the deal, it's likely someone else will," says Donna Hitscherich, director of the Private Equity Program at Columbia Business School. 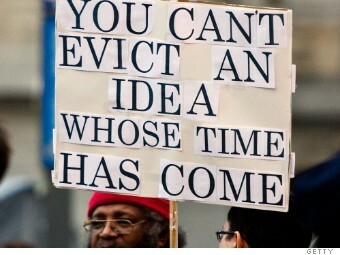 An Occupy Philly protester holds a sign prior to a 5 pm deadline to clear the encampment on November 27, 2011 in Philadelphia, Pennsylvania. It's easy to look at Occupy Wall Street and say it didn't achieve its major goals. No one went to jail for the financial crisis and inequality remains a huge problem. But the movement has brought these issues to the mainstream, and many of the Occupy organizers are now involved in other fights such as Black Lives Matter and the campaign for $15 minimum wages. Wall Street was on edge during the financial crisis, but there's a different kind of concern today. Banks should be humming along again. Instead, much the chatter on the street is about ongoing challenges. Just last week, the former CEO of Citigroup (C) said big banks don't work. They are "inherently unstable and unworkable," John Reed wrote in an op-ed. "Occupy was just a culmination of what began in the wake of the financial crisis," says Goldstein of Americans for Financial Reform. "This is what the public wants. I think that's very clear now.